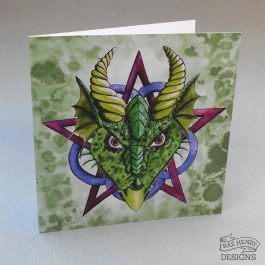 Original dragon and pentagram star design on a mossy green grunge background. 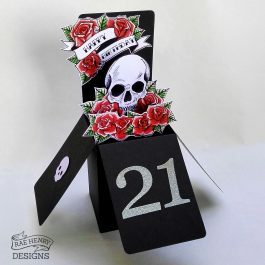 The card is blank inside, ready for you to write your message and can be used for any occasion such as birthday, anniversary, hand-fasting etc. It measures approximately 6×6 inches square and comes in a clear protective bag with a white envelope. 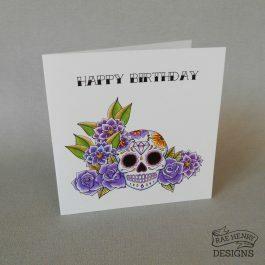 Gothic birthday card featuring a tattoo style black rose design on a grunge purple-grey background. 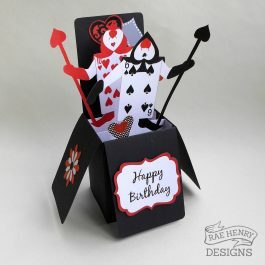 The greeting on the front reads 'Happy Birthday' and the inside is blank, ready for you to write your message. Printed onto uncoated white card with a matt finish, it measures approximately 6×6 inches square and comes in a clear protective bag with a white envelope. 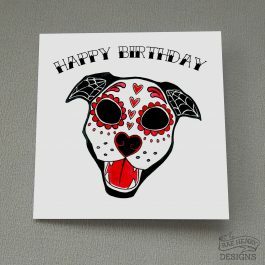 Original tattoo style sugar skull dog illustration in black and red printed onto high quality white card. 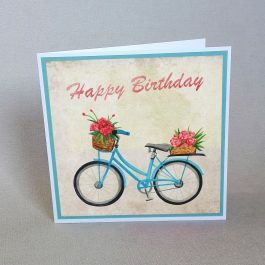 The greeting on the front reads “Happy Birthday” and the inside is left blank for you to write your message. 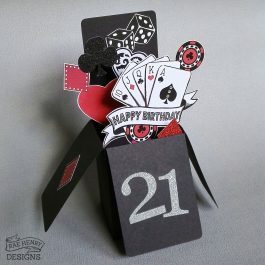 The card measures approx 6×6 inches square and comes in a clear protective bag with a white envelope. 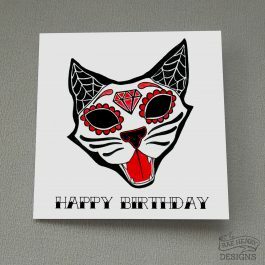 Original tattoo style sugar skull cat illustration in black and red printed onto white card. 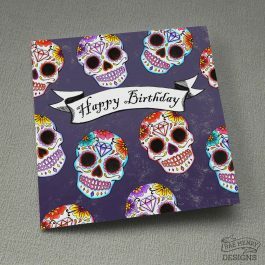 Colourful sugar skulls on a dark purple background with a tattoo style 'Happy Birthday' banner. 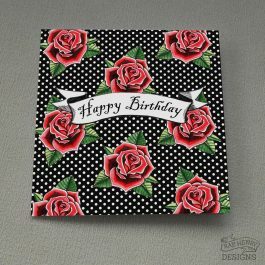 Tattoo style red roses and white polka dot design on a black background with a tattoo style 'Happy Birthday' banner. 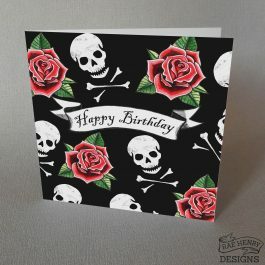 Tattoo style red roses and white skulls design on a black background with a tattoo style 'Happy Birthday' banner. Original sugar skull/ candy skull design inspired by day of the dead dia de los muertos. The skull illustration is printed in black onto high quality white card, and finished with blue glitter hearts. It can be used for all occasions including valentines day, anniversary, engagement, wedding or birthday. 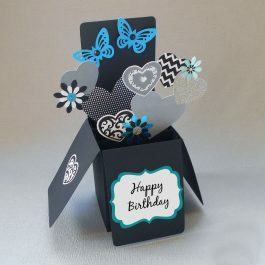 The card measures approx: 6×6 inches square and comes with a white envelope. The inside is left blank inside for you to write your message. Original sugar skull/ candy skull design inspired by day of the dead dia de los muertos. The skull illustration is printed in black onto high quality white card, and finished with green glitter hearts. 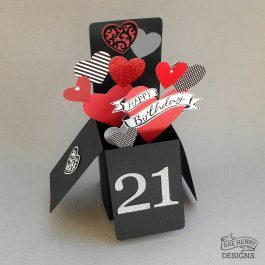 It can be used for all occasions including valentines day, anniversary, engagement, wedding or birthday. Original sugar skull/ candy skull design inspired by day of the dead dia de los muertos. 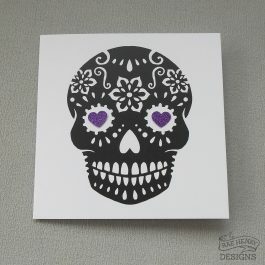 The skull illustration is printed in black onto high quality white card, and finished with purple glitter hearts. 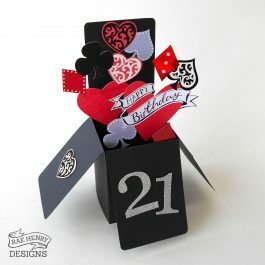 It can be used for all occasions including valentines day, anniversary, engagement, wedding or birthday. 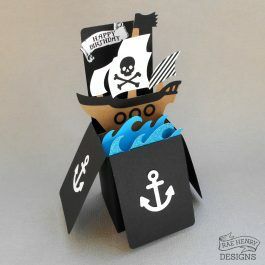 You can't go wrong with this Kraken card, perfect for streampunks, pirates and landlubbers! 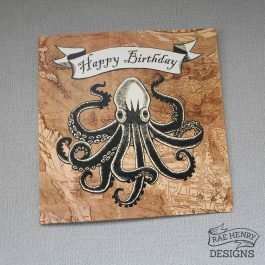 Featuring a detailed octopus illustration on a vintage style map background. Printed onto uncoated white card with a matt finish, the card is blank inside, ready for you to write your message. It measures approximately 6×6 inches square and comes in a clear protective bag with a white envelope. 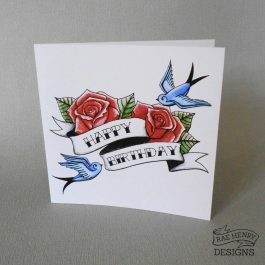 Rockabilly tattoo style swallows and roses design with “Happy Birthday” in the banners. Original illustration printed onto white card, measuring approx 6×6 inches square. 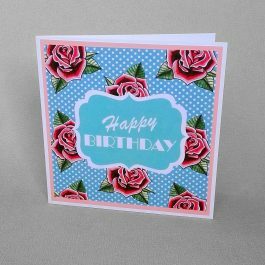 Rockabilly style swallows and roses design with “Happy Birthday” in the banners. Original illustration printed onto white card, measuring approx 6×6 inches square. 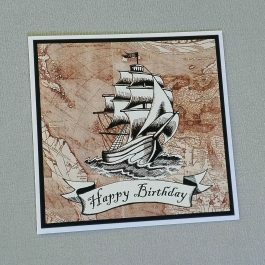 A traditional tattoo inspired anchor and roses birthday card. This nautical design is printed onto uncoated white card for a retro matt finish. 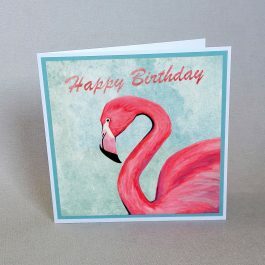 The card is blank inside, ready for you to write your message. It measures approximately 6×6 inches square and comes in a clear protective bag with a white envelope. Original sugar skull/ candy skull design inspired by day of the dead dia de los muertos. 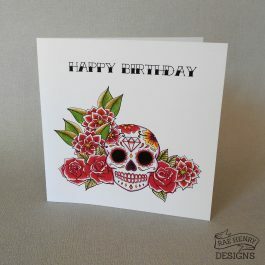 The skull illustration is printed in black onto high quality white card, and finished with red glitter hearts. It can be used for all occasions including valentines day, anniversary, engagement, wedding or birthday.